With any marketing making an impact is essential – This applies even more so when it comes to Roller Banner Design. 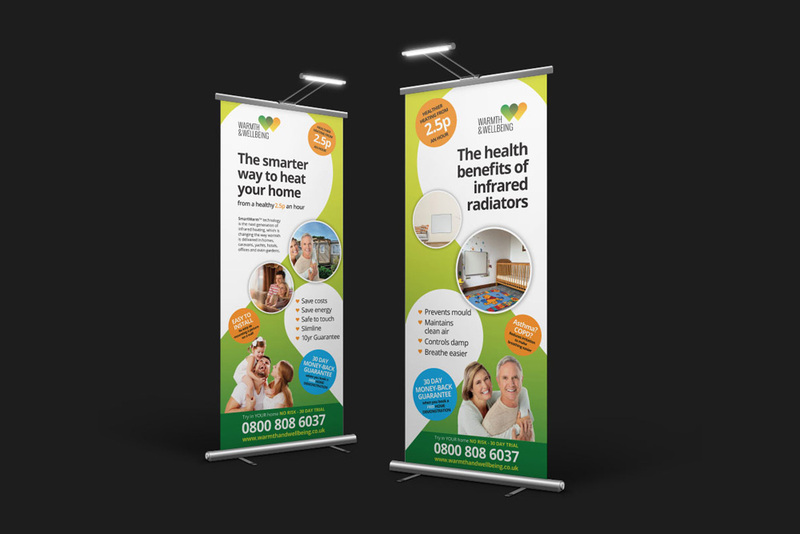 Roller banners are an ideal solution to grabbing attention at exhibitions, in reception areas, or out on the street raising awareness of your services, or business. What is a Roller Banner? Roller banners are one of the most commissioned form of print advertising. They are simple to purchase, easy to change designs and are simple to transport. They can be as minimal and striking, or as detailed and informative as you wish. Many people produce 2 to those specifications – One a headline based attention-grabber, and another provides further information. Greater impact can be achieved through good roller banner design, and coupled with a strong marketing strategy, your roller banner should increase leads, sales and enquiries. This is our speciality. Roller banners are so popular they can be purchased online for as little as £25. For an item that can be used again and again, that is remarkable value. If you are looking to get even more for your money and give your pop-up banner a longer lifespan, try not to use anything date dependent, such as offers or discounts. You can always produce a few designs that fit varying offers, or messaging for different audiences. The first question we ask anyone coming to us about pull-up banner design is ‘Where will this be used?’ – A roller banners design and layout can be drastically different depending up on its placement. An un-manned roller banner that is placed in a reception area, or walkway, may require more information. In this instance the entire banner can be used as the canvas. We will ask what it stands in front of – A banner against a white wall requires strong colours to stand out, but against a darker wall a more minimal white design would work better. A roller banner at an exhibition requires a different approach. The pop-up banner may be placed behind a plinth, or a desk, rendering the bottom of the roll-up banner unusable as it would not be seen. An exhibition normally guarantees better, directional lighting so we can design your roller banner with this in mind. One of the most common problems we come across when designing a roller banner is image quality. As designers, we have access to many high-resolution images through stock photography websites, so can often bypass image concerns. There are a number of occasions though when a client has insisted upon the use of a supplied image. Many times this image is not high enough quality to blow up to a standard roller banner size. If you are thinking of providing your own images ensure that they are 300dpi, you have the image rights to use them, and they are not taken from Facebook or Google Images. You do not own these images, so cannot legally use them. 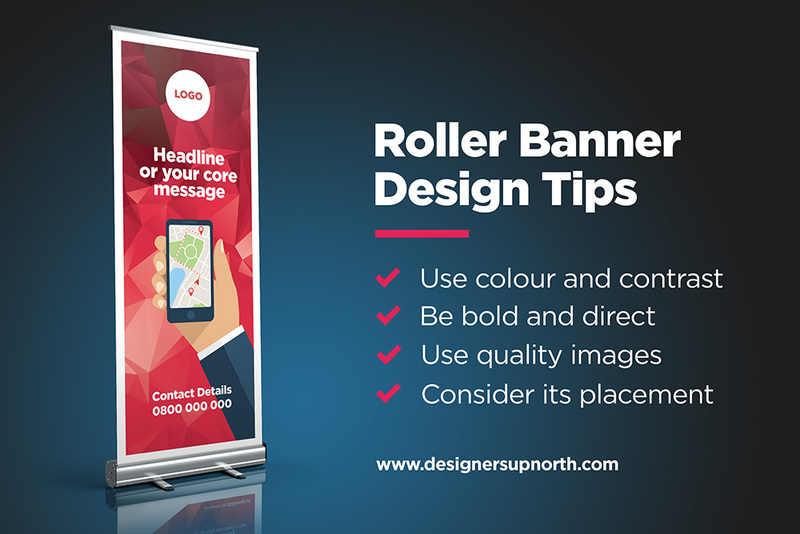 When it comes to how to create a roller banner design, there are a few simple tips that you can follow that will improve your design no end. Very often the most effective roller banner design follows an age-old format. Similar to poster design. The very top of the banner is where your headline should sit. It should clearly state your service, or how your business solves a problem. Most roller banner design feature the logo at the very top, and often larger than one would often use it. This makes sense. The top of your banner is the first thing people will naturally look at. Use this to tell them your core message. This is no time for rocket science, or for designers to try and re-invent the wheel – Deliver your message in a strong, impactful and considered manner that fits your brand and appeals to your audience. Some of the best roller banner designs are the simplest. A clean white background, coupled with a strong headline, a complimentary strapline and a beautiful image often work best. 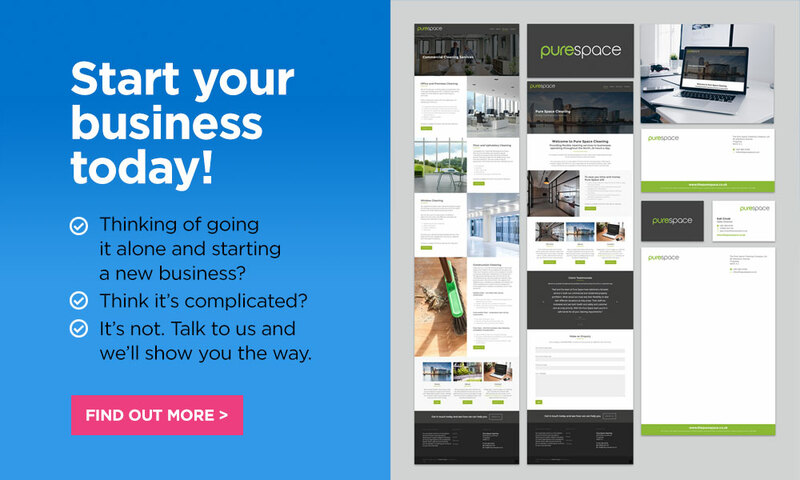 When a client receives a design of this nature on email, they often fail to visualise this against a dark exhibition space, or a busy background. We often provide a mockup, showing how this minimal design works in context. It helps the client see how a clear, strong message can rise above the noise of an overly-busy banner design. We have seen many examples where clients have used a free roller banner design website to save costs. The one thing many forget to include is a contact. A website or phone number is essential in driving customers to find out more. When this is pointed out everyone goes ‘Oh yeah!’, but it still happens. Week in. Week out. Make sure you include a contact on your roller banner design. The easiest solution, though not the cheapest, is to ask a professional roller banner designer to create your business banner designs. If you would like to speak to us regarding your banner design or would like to discuss some roller banner design ideas with us, please get in touch. Costs for designing your roller banner vary as soon as you venture into online searches. Some companies offer the service for free as part of your purchase; others make a small charge to create something for you. As with any product you will get what you pay for. A cheap roller banner design may not be such a bargain once you see what comes back. On average it appears £70 will get you a design, although how bespoke that is to your business would need further research. We charge around £125 – £150 for a premium, considered roller banner design. This includes the cost of stock photography should it be required. We include copywriting within that cost, ensuring you have a clear, consistent message and tone of voice to your marketing. It’s the least your business deserves. Ever want to contact Giggstar? If you’re looking for help with your creative business, have a burning question to ask Guru, or simply want to interact with The Giggstar team, the quickest way to get our attention is to hit us up on social. We’re on all the major platform, and we try and respond to every comment, reaction and tag we see – let’s connect!